Surprising as it may sound, not everyone living in this city has grown-up listening to The Beatles – including myself. However, even as a non-Beatles-enthusiast, by the end of the fantastic ‘Let It Be’ show at the Royal Court, Liverpool, I was tapping my feet and clapping my hands as the performance took the crowd back in time to the sights and sounds of the Fab Four. The Beatles tribute show was a timeline for Liverpool’s much-loved musical masters. From the very early stages of their careers that brought them to attention in The Cavern Club, right through to their huge 1965 Shea Stadium concert in New York, Let It Be is a show which replays memories from 60s Beatlemania, treating 21st Century audiences to a taste of what it was like in that golden era. Above all, it is the music that the fans still crave, and it was the juke-box Beatles hits that they got on Tuesday night, from ‘She Loves You’, ‘I Want to Hold Your Hand’, ‘Strawberry Fields Forever’, ‘Lucy in the Sky with Diamonds’, ‘Drive My Car’ and more. The long list of classic tunes carried on throughout the show. The production expressed itself visually in a cycle of changing years, with different colours and imagery to match the band’s performance in recognisable Beatles fashion. Above the set hung two screens shaped like 1960s television sets to project images of stage action and atmospheric film footage of the Fab Four’s success. A noteworthy aspect was the screening of 60s’ advertisements to evoke a nostalgic atmosphere, and Let It Be certainly delivered on that note. There are Beatles fans all over the world, thought it’s doubtful that the show would work as well outside Liverpool; forever known as the home of The Beatles. The production ended with a particular favourite for many, ‘Hey Jude’, as the theatre lights shone on everyone standing and singing along to cap a memorable night. 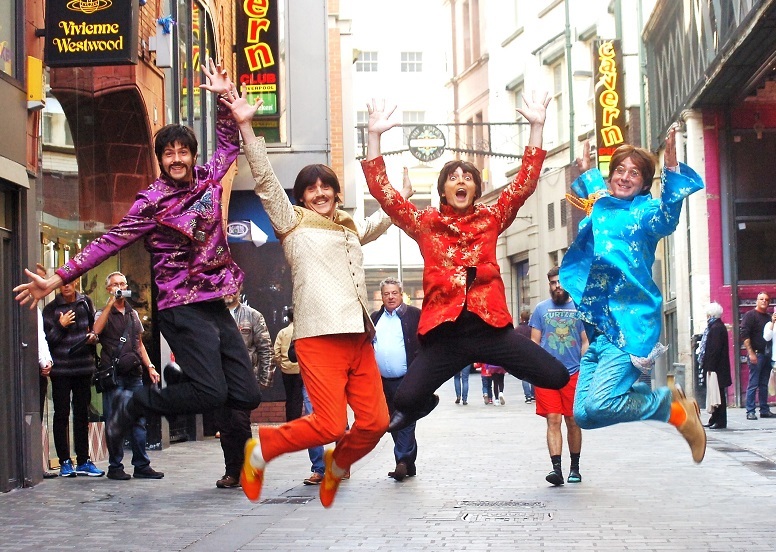 Huge applause was deserved by lookalike performers Paul Canning (John), Luke Roberts (Ringo), Emanuele Angeletti (Paul) and Liverpool’s own Paul Mannion (George). Let It Be, having had a successful stint in London’s West End, runs at the Royal Court from October 8th to November 14th.